Eddie Hamid, CEO and President of iAdvance Now, Inc., is one of the newest in a new generation of business leaders. Under Hamid’s vision and leadership, iAdvance Now offers a wide range of alternative financing solutions to companies in every industry. Startups and small organizations that are typically unable to secure bank or institutional funding can turn to Hamid and his expert team for the assistance they need to grow. Based in the New York City area, the company was formed by Hamid and his hand-picked professionals, all of whom are able to evaluate an entity’s financial situation and recommend creative solutions. 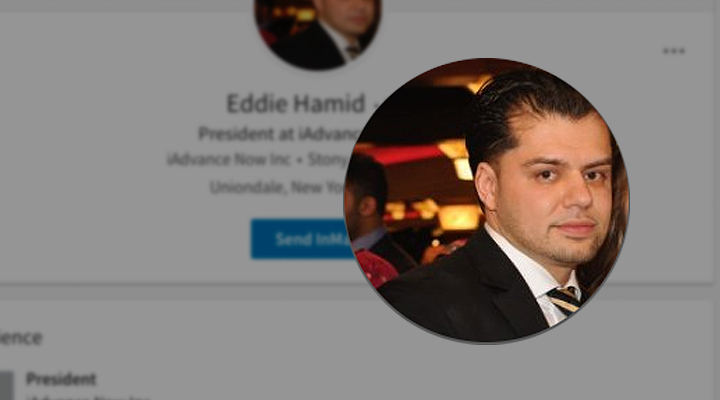 With a lengthy background in the financial industry and a personal commitment to helping people achieve economic empowerment, Hamid has what it takes to lead iAdvance Now and create opportunities for anyone dedicated to their own success. With Hamid’s guidance, iAdvance Now has grown into a key resource for companies in a variety of industries who seek business credit, invoice factoring, lines of credit, term loans, and credit card cash advances, among other services. At iAdvance Now, his team has already helped many entrepreneurs in retail, trucking, automobile, entertainment, wholesale and other industries get the financial assistance they need in time to achieve new heights of success. I’ve worked in the insurance and financial field for more than a decade, which gave me the knowledge to see firsthand how tough it is for new companies to obtain financing when they need it most. I was inspired by my personal belief in economic empowerment, namely that all people have the right to be successful if they are willing to work hard and stick with their dreams. My company, iAdvance Now, is in the business of helping other companies obtain financial resources. Our partners in the financing industry, along with our professional team of experts, help new firms uncover funding sources they never knew existed, and our extremely reasonable fee scale allows new entities to prosper, and helps us pay our bills so we can continue to help the next wave of companies that need assistance. We have been in business at iAdvance Now, helping new companies reach their goals, for more than three years. After we opened our doors, it didn’t take long for entrepreneurs to find us and help us reach a “critical mass” of work which allowed our firm to continue helping people who came to us. I’ve always had a deep commitment to economic empowerment as a principle and a goal, so I never really doubted that. But yes, as with all organizations, those first few months are challenging, but if you believe 100 percent in the goodness of your aim, then nothing can stop you. We did a small advertising placement and found our first few clients that way. From there, word of mouth was so positive, that we soon had hundreds of small businesses turning to us for assistance. We advertise where people who need our services can find us, which means online primarily and in industry publications. Our marketing efforts are really just about getting the word out. I’m not the type of person who has too many grueling decisions to make, but when the chance comes for iAdvance Now to expand its reach, that will not be difficult. It just means we’ll be able to help more business owners. My perseverance and dedication to economic empowerment. Starting this company, iAdvance Now. The process has been incredibly rewarding and we’ve been blessed with such an amazing team. I’m thrilled that we continue to grow and now have the ability to assist just about everyone who comes to us. Our menu of product offerings will continue to expand as well, and that gets my excitement level up. We always try to create innovation in funding. The Lean Startup by Eric Ries, and Think and Grow Rich, by Napoleon Hill. There are dozens of books about business that are applicable to the subject of how startups can get what they need to succeed, but I also enjoy non-business titles that offer philosophical guidance about empowerment and financial strategy-making. A couple that come to mind are Steven Covey’s “The 7 Habits of Highly Effective People,” and a timeless book by Sun Tzu called The Art of War. Both are powerfully instructive and enjoyable. We’re always upgrading our technical systems so that we can better serve our clients. Recently, we obtained a state-of-the-art computer arrangement that allows us to offer lightning-fast customer service and client response times.